The Best ROI Can Save an Employee’s LIFE! It was a Friday morning like any other. I was planning my calendar for the following week, wrapping up proposal notes and client deliverables…my normal routine. I popped into my inbox as I typically do on intervals throughout the day and there it was; this amazing email thread. At first glance I thought, “Is this a hoax?”. I’d been copied on an email to one of my employees that read: March 30, 2017 is a day that Ronnie Hinton will never forget. It started out as a regular day at the National Geospatial-Intelligence Agency, where Ronnie served as the Assistant Manager of the fitness center. Things changed quickly when Ronnie realized that an employee working out in the fitness center was in need of medical attention. Ronnie’s experience as an EMT and Certified Sports Conditioning Specialist allowed him to stay calm as he administered CPR and provided instructions to others helping with the rescue efforts. Ronnie and two other responders were labeled as heroes for their decisive action during the emergency that ultimately saved the employee’s life. 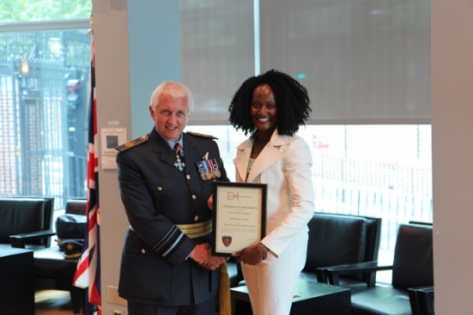 On Monday, July 17, a Commendation Ceremony was held at the British Embassy in honor of those who played a role in saving the life of the NGA employee. 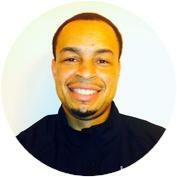 Ronnie, an avid biker, expert trainer and fitness enthusiast, has a personable approach coupled with knowledge and focus. He is also popular among those who seek his advice on returning to workouts after injury due to his rehab background. We are so proud of Ronnie for his achievements in the Health and Fitness industry as well as his drive to promote safety at facilities under his supervision. As Founder and CEO of Aerobodies Inc., I lead an amazing team of experts, coaches and trainers that we call our High-Impact Leaders. I believe that every person in our organization can be a high performer when they learn to connect their physical performance with their emotional intelligence. It’s not enough to know how to demonstrate leadership. It’s when and where that truly counts the most. That is the Leadership prowess that Ronnie Hinton displayed. And I was so proud to attend the British Embassy Commendation Ceremony in his honor to applaud the efforts of all those involved. Our team of fitness experts demonstrates their leadership everyday in helping our customers achieve their health and wellness goals. We also partner with companies and public sector organizations to support their mission objectives so they can implement similar techniques and strategies to improve the lives of their employees. Does your organization need more High-Impact Leaders? Let us help you develop your team. Click here to learn how we can create a turnkey solution for your organization.